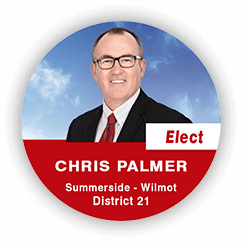 Chris Palmer has served Summerside – Wilmot since the 2016 by-election and is currently Minister of Economic Development and Tourism. He was Government Whip in 2017 and has served on the Public Accounts Committee, Education & Economic Development Standing Committee and the Infrastructure & Energy Standing Committee. He sits on Treasury Board, Policy Review Committee, the Health & Wellness Standing Committee and the Agriculture & Fisheries Standing Committee. Chris, who holds both a BBA and an MBA from UPEI, is a serial entrepreneur, owning and operating a number of businesses before entering public life. He has been an engaged volunteer for many years, serving on boards including Downtown Summerside Inc, Summerside Chamber of Commerce, College of Piping, Summerside Regional Development Corporation, Summerside Dolphins Swim Club and Tourism Summerside. As a young man, Chris moved away for work, and has never forgotten the disappointment of leaving. Today, he is a tireless advocate for identifying opportunities to keep people here and to encourage others to move back home. Chris lives in Summerside with his wife Kyla and their two children, Logan 17 and Sydney 14.